When Google’s senior vice president of engineering Vic Gundotra put up a slide during the morning keynote speech at Google I/O 2011 developer conference, the crowd of developers erupted into thunderous applause. You could have almost felt there was something in the air and you needn’t be a rocket scientist in order to figure out that Google will poke fun of its Cupertino frenemy given how Steve Jobs frequently downplays Android’s success at Apple’s events. 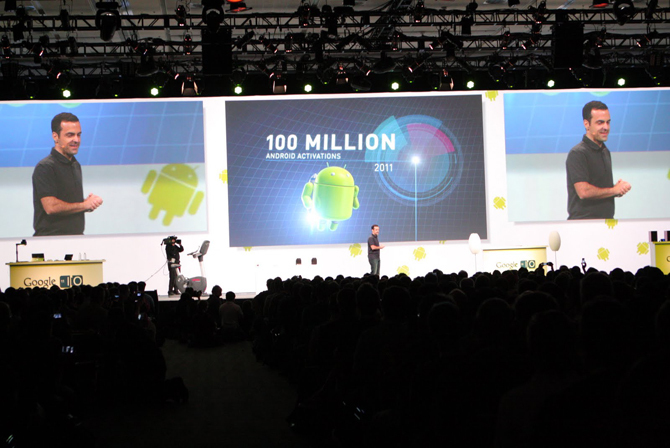 Android launched nearly three years ago with a single device, on one carrier, in one country. Eight Android releases have shipped thus far and there are now more than 310 Android devices around the world, the search company confirmed.